His Five-Chamber Nursery Roosts are 24″ wide by 37″ tall. The exterior consists of 1/2″, 4-ply, outdoor plywood. The sides are 2″ X 6″ spruce with both ends cut to 30 degrees. Grooves cut into the sides enable easy installation of the four 3/8″ thick plywood roost partitions after the outer shell is complete. The front is 22 and 1/8″ long, the back 36″. Prior to assembly, he cuts two 8″ long ventilation slots, each 1/2″ wide by 8″ long, 8″ above the bottom end of the front piece, and two 3/4″ wide by 8″ long slots 12″ from the bottom of the back piece. 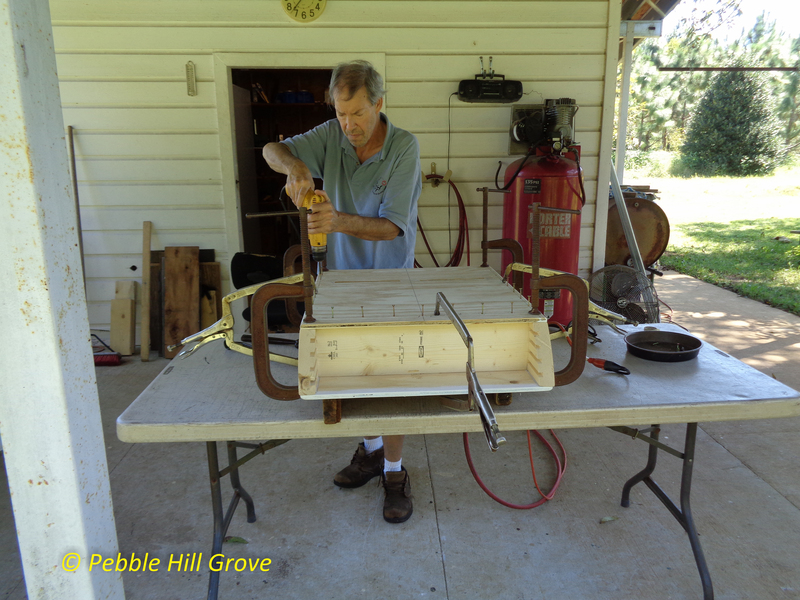 He uses clamps to hold the front and back pieces and “ceiling” (of 1″ thick spruce) in place soon after coating the contact areas with paint (to help ensure a tighter seal against water leakage). He next adds a 5/8″ thick wood screw every 3″ to securely hold the front and back and ceiling in place. Prior to inserting the roosting partitions, horizontal grooves, 1/32″ deep are cut every 3″ in both sides of each of the four partitions, providing a secure footing for roosting bats. After inserting the partitions he drills three holes all the way through the new structure from front to back, spaced along the mid-line and inserts a 1/4″ by 7″ hex bolt one at a time, each passing through 5 donut-shaped pieces of 3/4″-thick spruce wood, one for each roosting space, bolted down tightly to prevent warping. The roof, added last, consists of 1″ by 8″ spruce, cut to fit flush against the back, but projecting 1″ beyond the front and sides. When complete, each house is painted with a primer and three coats of paint, except for the roof which gets 6 in addition to being caulked. The paint color is medium brown for use in the southern U.S., black for cooler northern areas. These houses can be used singly on buildings or poles, but Frank recommends pairing two back-to-back, 2 and 1/2″ apart on a metal pole, with a tin roof 2″ above the houses and overlapping 6-7″ on all sides. He has built over 100 of these houses so far for others and reports nearly 100% occupancy. These are what he calls his Five Chamber Nursery Houses, each capable of sheltering up to 400 bats, 800 in a double. Georgia pecan grower, Frank Bibin, became organic after attracting thousands of Brazilian free-tailed bats (Tadarida brasiliensis) to his orchard. This pair of houses remains maintenance free after 15 years. It is longer, but otherwise identical to those he currently provides.